Mr. Garrison assigns the boys learn out about Vietnam from somebody they know. Stan's Uncle Jimbo and his friend Ned tell the boys their outrageous tale. Mr. Garrison doesn't believe the boy's report and gives them detention. 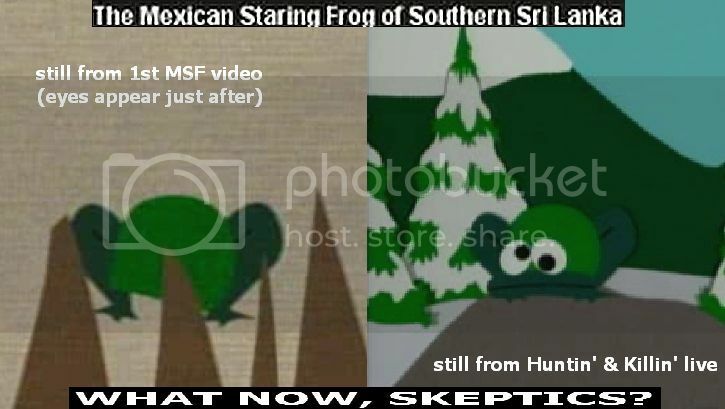 They plot revenge against Stan's Uncle by submitting a phony video of the Mexican Staring Frog of Southern Sri Lanka to them. Strangely innocent fun from the early years, with some great characters (Jimbo and Ned, Jesus) who are hardly used anymore. Garrison's Vietnam story makes me lol every time, as do all jesus and pals attempts to get more audiences. The futility of their battle (it's over like, 5 people) makes it even funnier. Was Mr. Garrison really in Vietnam? Its ok, Montel. We all wanna touch the childeren sometimes its perfectly natural. I'm such a dork that I paused the initial Mexican Staring Frog video to see what that green & black blur was. This & City on the Edge of Forever are currently my top two favorite episodes. I love Jimbo & Miss Crabtree!